Yes, I just refuse to use PowerShell (just yet). I know that powershell can do this and that and god MSFT knows what not but with all these bells and whistles doesn’t come at cheap price. I mean if something works just fine and smooth then why you actually need to use something new. It is true for good ‘ol DOS (with BATCH file). I still use it for most of my automation tasks. The most good thing about DOS is it doesn’t require me to Google much because I know what I need to do if I am required to do something. But if I am asked to do same thing using Powershell then it is very likely that I will spend more time browsing through forums to find solution. I am not saying that PS is the worst shell ever invented … but I think it is not justified to spend time on it unless it can do something that I can’t do using DOS(read it as WITH BATCH file). Above command will fireup notepad. This seem to be very simple command but it is very handy when you want to start any application from BATCH file. Another use could be to open website from command prompt. Above command will open up http://gaurangpatel.net in your default browser. Neat, right ?? TASKKILL : This command is used to kill any task. This command can use few switches with it for different options like force kill or kill whole process tree. What I really liked about this command is, it can actually kill exes by just name!! You also have option to kill task by process ID or service. 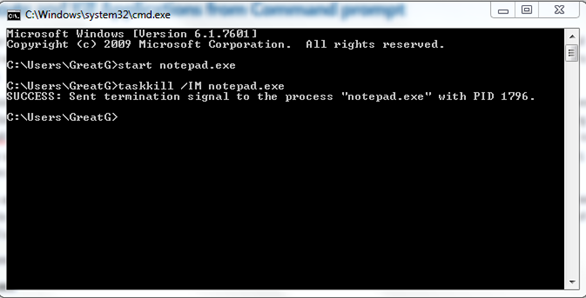 You can read in more details about this command at TechNet. Just as a side note, if you are using windows 7 or vista (still on vista ?? really ??) then you may need to open command prompt as Administrator. Ok, this is enough for now. I will post more commands later on. Becoming administrator of my own machine !! This entry was posted by Gaurang on October 15, 2011 at 9:29 pm, and is filed under DOS, How To. Follow any responses to this post through RSS 2.0. You can leave a response or trackback from your own site.